Wow, you can pull a hamstring hating like that. The author of this love letter, of course, is none other than Raider Take’s favorite columnist, the bloviating wordsmith of unintentional haiku, the guy who assured us that Al Saunders was the next head coach of the Raiders, and that winning big was the only way for the team to sell out the Coliseum. You know, the guy who last year wrote not one, but two Raider-hating articles within a span of 24 hours. Do you think we might have a bias problem here? Let’s return to this latest love letter, which was published before the recent Chargers game, and which has been stuck in my craw ever since. As a Raiders fan, do you not feel personally attacked? You and your “lying eyes” and “delusional faith,” you "blind" imbecile! The sad thing is that this man was likely once a sports fan just like us. But he has forgotten what it’s like, or means, to be a fan. The job has apparently worn him down and crushed his soul. He hates the Raiders, he hates you, and he probably hates professional sports. I’m sure that it’s hard to maintain a fan’s innocent and unwavering fanaticism when you’re on the sports beat and grinding out stories under deadline. Any time something becomes your job, it naturally loses a bit of luster. But that’s no excuse to denigrate the very basis of your existence as a sportswriter: the reader, a.k.a. the fan. I’m sure that Jerry McDonald of the Oakland Tribune and Phil Barber of the Press-Democrat have some rough days, too, but they still seem to love the sport and respect the fan. The above-referenced "lying eyes" column was published on Friday morning, November 24. Think about that. Unless our friend had this piece in the can for a few days, he must have written it on…Thanksgiving! What a joyous way to spend the holiday. It pains me to think of what he has planned for Christmas. His grammar here is twisted as usual ("is as irrelevant as it was since? "), but he seems to be saying that the Raiders have been irrelevant since 1963. Good grief, isn’t there an editor in the building over there on Mission Street? Or does our guy simply have carte blanche to conduct drive-by journalism, no matter how absurd his statements, grammar or logic? Maybe we should all chip in and buy our favorite columnist a one-way ticket to Canton, Ohio, where he can learn about the Raiders’ irrelevance since 1963. In fact, he can fly out on December 25. He’s clearly overdue for a happy holiday. P.S. Thanks to LeighRaider in England and BamaRaider for sending links and helping inspire this take. When you say that someone within the organization is undermining the Oakland Raiders, and when you say that this person is neither a player nor a coach, that pretty much narrows the field, does it not? Thanks to Calico Jack for tipping us off to this late-breaking article in which Art Shell makes just such a claim. Among other things, he says: "I sit back and I watch things happen and then it gets to the point where you cross the line. That line has been crossed and I won't sit back and allow it to happen anymore." He adds: “When you root against me, you're rooting against the Raiders. When you root against Tom Walsh, you're rooting against the Raiders. And for someone to do that is unconscionable. It's unconscionable. It's detestable and I think it's an outrage." Hey, don’t mince words, Art, tell us how you really feel! All kidding aside, this is a sad moment for the Oakland Raiders. As much as I respect Art Shell’s fire and fortitude in this matter, I’m disappointed that he took it to the media. The problem with not naming names while so specifically narrowing the field is that now everyone is going to be scrutinizing the team’s organizational chart in order to speculatively identify the alleged Judas. It drags innocent people into the fray. It leaves dirty laundry flapping in the Alameda wind. I sympathize with Coach Shell. If this is true, he is right, it’s unconscionable. But as a coach, he should know that he needs to confine team business to the proverbial locker room. We’ve been railing on Randy Moss for airing his vague complaints in the media. This is no different, in my opinion. Art Shell must set, not fail, the example. It pains me to see my beloved Oakland Raiders embroiled in strife yet again. I am rooting for Art Shell. I am rooting for everyone in the organization. I want them to work this out. Preferably in private. They say there’s usually a calm before the storm, but it could also be said that there’s usually a storm before the calm. This is our storm, friends. Batten down the hatches, but have faith that clear skies await. Update: 12:35 - RaiderFans.net has confirmed the dismissal of Tom Walsh as offensive coordinator. According to this report, he will be replaced by John Shoop. Click here to read more. Update: 12:49 - The Oakland Raiders have confirmed that John Shoop has replaced Tom Walsh as offensive coordinator. Walsh will remain on staff (thanks OakZombie for the clarification). My Take: 1:00 - I have no doubt that Tom Walsh gave it his all. I harbor no ill will toward the man. He just wasn’t up to the task. He gave up a nice life in Idaho to assist his friend Art Shell and to become a Raider again. I commend him for his effort and loyalty. That said, I’m not shedding any tears over his demotion. Football is a ruthless performance-based business. First you get the boot, then maybe you get the Hallmark card. In fact, this decision should have been made weeks ago, if at all this season. I expect to see an uplift in our offensive performance in the wake of Walsh’s demotion. The spin out of NFL headquarters on Sunday's blown call is as follows: Vincent Jackson's celebratory corkscrew was an intentional forward fumble, which by definition is, in fact, an illegal forward pass. In other words, a fumble is a pass. Got that? Allow me to throw my red flag. Jackson may have deliberately fumbled the ball, but he did not intentionally fumble the ball. Big difference. Do you think he intended to fumble the ball? Of course not. He intended to show off. He did not intend to fumble. This dates back to the Holy Roller, after which the rules were changed to make it illegal to fumble the ball forward in an attempt to gain unfair yardage. Jackson's spike was not an intentional act to move the ball forward. Nor was it a pass, by the way. While the call was questioned on the field, NFL Supervisor of Officials Mike Pereira confirmed to ESPN's Chris Mortensen that the call was correct -- and not without precedent (PRECEDENT WAS THAT THE CALL WAS RULED A FUMBLE, NOT ILLEGAL FORARD PASS). Jackson spinning the ball forward when he was not down by contact constituted an intentional illegal forward fumble and thus an illegal forward pass. Had he spun it backward, it would have been a live fumble. Hmm, what's missing from this equation....LOSS OF DOWN, PERHAPS!? Someone will come in here and say, well, Jackson got a first down, so while the original pass from Rivers to Jackson was on fourth down, the downs were reset with the completion for a first down. Okay, then why wasn't it SECOND down after that, instead of first down? They spent ten minutes getting this wrong. It takes one minute to review the Digest of Rules regarding the forward pass. So, let’s look at this the NFL/ESPN way. Say it’s 4th down and 10 on the Raiders’ own 20 yard line, with a minute to go against the Chargers. Aaron Brooks hits Randy Moss in the flat. Moss sprints upfield all the way to the one-yard line before tripping and hitting the turf. He thinks that he’s been tripped up by a defender, so he gets up and proceeds to corkscrew the ball into the ground in celebration. The Chargers recover. According to this new "correct" precedent, the Raiders are hit with a five-yard penalty for “illegal forward pass.” It’s now first and goal for the Raiders at the Chargers’ six-yard line, correct? Yeah, right. I’m sure we’d get that call. Right after pigs fly and the devil serves ice cream. P.S. According to Butch's email, here are the relevant email addresses: mpereira@nfl.com and rgoodell@nfl.com. If you write, I recommend being civil and focusing on the facts while reminding them that the Raider Nation is watching. P.P.S. See Stick 'Em's stick for more on the Burress precedent. Well, can we get credit for consistency? Three straight games against AFC West rivals, three losses by a grand total of 15 points. My take on this game is almost identical to last week’s game against the Chiefs. We played a tough divisional rival with a dominant running back. Our defense kept us in the game. Aaron Brooks masterfully eluded pressure. We didn’t make good adjustments in the second half. Brooks got picked. And, for the seventh straight game, we didn’t score more than 17 points. People get upset when I focus on the positives. Well, I’ve covered the negatives. They’re the same every game. The positive is our defense, and that fact that this team, under challenging circumstances amid a lost season, is still keeping things close and still playing to win. Remember Kerry Collins shuffling to the line like a zombie against the Dolphins exactly one year ago (November 27, 2005)? I feel much better about this team, at this time, this year. Call me crazy. P.S. I, too, was disgusted by that “illegal forward pass” nonsense. Against Seattle it was our guy allegedly barking signals to confuse their defense. Against Denver, it was Chris Carr allegedly staying out of bounds too long. Every week seems to bring some weird foul or creative interpretation of the rules. The zebras are thieves. However…this particular fumble was a clown’s gift, not something that we really earned in the field of play (like, say, Brady’s “tuck” fumble in the playoffs). I’m not happy about the call. But I can’t blame our loss on it. As I said in my earlier take, making the most of broken plays is not a strategy. Brooks is working his magic again, eluding sacks and running for positive yards. But he needs some playcalling help if he's going to break our no-touchdowns-in-the-second-half curse. Our offensive line is playing a bit better with Slaughter and Hulsey on the left side, but it's not enough to consistently contain the rush. I'm seeing a lot of broken play-action plays. Time for something new. The second half curse must be broken. Touchdowns must be scored. Our defense is giving us every chance to win this game. Chargers LB Akbar Gbaja-Biamila said on Sirius NFL Radio that he expects the Chargers to “demolish” the Raiders and predicted a similar outcome to the September 11 shutout. Needless to say, the Chargers are feeling pretty cocky right now. Much was made over Larry Johnson racking up the yards last week, as if it showed some unforeseen crack in our defensive armor. Well, that’s what Larry Johnson does, he runs all over teams, that’s why he’s considered one of the top three running backs in the NFL. He’s currently leading the league in rushing yardage. He’s second in the league in touchdowns. He runs over everyone, not just the Raiders. So I’m not too broken up about it. Our defense limited the Chiefs to 17 points on the road, and our offense should have won that game. Now we get to face L.T., the league leader in touchdowns, and third in the NFL in rushing yardage to date. In one game last year against the Raiders, he ran for a touchdown, caught a touchdown pass…and threw a touchdown pass. When we limited him to one touchdown and 131 yards on September 11, that could have been considered containment based on his past exploits against the Raiders. Unfortunately, L.T. now seems to be gaining steam. He’s scored 12 touchdowns and racked up 462 yards over his past four games. The Raiders have won two out of the last 22 games against division rivals, and the Chargers are on a roll. So they’re going to “demolish” the Raiders, right? No. You will never hear me concede defeat of the Raiders until it’s officially on the books. I never predict my team to lose, let alone get “demolished.” I expect the Raiders to win on every, or any, given Sunday. I will concede, however, that the Raiders must do certain things in order to escape defeat. In this instance, these things are numerous. For starters, we must contain (in the true sense of the word) Tomlinson while putting heat on Rivers, who, much to my chagrin, is emerging as a true force at QB. But don’t tell me this order is too tall. The Raiders defense has not allowed more than 17 points over the past six games. The real key will be on offense. One thing that won't work is the same old thing. Our offensive line is a disaster, and no measure of wishful thinking will alter this reality. Thankfully, Brooks was masterful last week in eluding the rush, but that will only take you so far…Making the most of broken plays is not a strategy. The trick is to complete plays before they’re broken. And with this o-line, that means sooner, not later. Remember on opening night against the Chargers, when we finally called those horizontal quick outs to Moss, who proceeded to chew up the considerable cushion afforded by Quentin Jammer (and remember when we quit calling those plays, despite their effectiveness)? Remember last year, when our starting running back caught 70 passes? Brooks’ quickness under fire shouldn’t be used as a crutch. Many of the plays themselves should be quick. Also, considering that the Raiders are so maligned for their “vertical” philosophy, how many true long bombs have you seen attempted this year? Think about it. I know I’m contradicting myself by begging for quick plays, then questioning the lack of long bombs. Also, I’m aware that the vertical game is a bit difficult when your quarterback has been rendered horizontal. Still, why not just go for the long straight strike more often? It’s not like Moss and Whitted lack speed. It’s not like a 50-yard interception is much worse than a Lechler punt after yet another three-and-out. So, the long and the short of it is that the Raiders must surprise the Chargers by going short and long, and by having more than three running plays at their disposal. In terms of playcalling, we need to be quick and aggressive. The only way to serve Gbaja-Biamila a plate of crow is for the entire offense, player and coordinator, to raise their game and, for once, score more than 18 points. The Chargers think they're going for a walk in the park. I hope our traps are set. Thanks to the readers and commentators of Raider Take for making this a fun place to hang out, and for inspiring lively discussion and debate about our team. Thanks to the Oakland Raiders for being a focal point of bonding and entertainment for my family, dating back more than 30 years, and spanning two generations (with Mini Take ready to make it three). Thanks to Amy Trask and crew for devising a sensible new ticketing program that is packing the house. Thanks to those local sportswriters who report on both the good and the bad of the Oakland Raiders without resorting to immature cheap shots or sloppy reasoning. Thanks to my fellow Black Flag Network members, Calico Jack and Stick 'Em, for their continued insights, support and inspiration. Thanks also to RaiderNews.com (aloha AllyOop! ), RaiderFans.net (thanks Raiders40! ), Raider Nation Podcast, RaiderWorld.net, Raiders Links, Inside Bay Area's Raiders Page, and other forums that spread the good word. Thanks to the new generation of Raiders players who provide a foundation for good things to come. Thanks to the veteran players who continue to set a competitive tone amid challenging circumstances. Thanks to all of the Raiders fans who make the gameday experience fun and familial. Thanks to John Madden for an incredible pre-game speech prior to the game against the Arizona Cardinals. Thanks to Greg Papa for blessing us with outstanding play-by-play. I listen to other team broadcasts via Sirius NFL Radio, and Greg Papa is clearly the cream of the crop. Thanks to Jim Otto, Fred Biletnikoff, Tom Flores, Jim Plunkett, Art Shell and other Raiders legends for their unwavering allegiance to the team and the fans. They embody the loyalty that defines both the Oakland Raiders and Raider Nation. Thanks to Al Davis for fostering the greatest franchise and fan base in the NFL. He is the soul of the Raiders, the originator and innovator of the authentic Oakland Raiders experience. 1. The Raiders defense has not allowed more than 20 points over the last six games—despite getting very little help from the offense. Following are our opponent point totals over this span: 13, 9, 13, 16, 17, 17. This, friends, is something to take pride in, and something to build upon. Imagine if our offense were simply marginal. Imagine if our offense could, say, score 18 points. 2. Aaron Brooks wasn’t merely elusive today. He was a magician. He could have easily been sacked five or six times behind a line that was doing a magnificent impersonation of saloon doors. Randy Moss was also a magician, as he managed to make himself invisible, despite all of the extra time purchased by Brooks. Yes, that was an awful interception to end the game. But this game wouldn’t have even been close without the moxie and agility of Aaron Brooks. Say what you will about our lack of a long-term vision at this position, the late interception, etc. For this one game, Aaron Brooks came straight out of the ice chest and lit a much-needed fire on our offense, with very little help from the offensive line or the starting receivers. 3. As you can tell, I’m really trying to focus on the positives, because I’m tired of rehashing the negatives, such as being unable to adjust and score points in the second half. Really, this inability to score during the last 30 minutes is verging on supernatural. As Raider 00 commented in my earlier take: “You would think even by dumb luck, you would get a turnover, a field goal, a lucky big play, something.” Nope. The little green aliens who control everything apparently won't give us a break. But I’m done with the coaching v. execution argument. I’ll still get on my high horse if we do something utterly crazy, like fail to enact a hurry-up offense while two scores down with less than five minutes to go, or have Andrew Walter go pass happy in blustery Seattle, but I’m resigned to our fate of awful offensive line play (due to lack of talent), weak receiving corps (due to motivational issues compounded by a strange depth chart), and questionable playcalling with an inability to make effective second-half adjustments (Tom Walsh). I’m now going to take my medicine like a good little patient, as I’ve already gnashed my teeth to the nub. 4. The Raiders are trying and fighting and, unfortunately, still losing. But I can live with the latter because of the former. With guys like Curry, Fargas, Williams, Madsen and Morant waiting in the wings, and with offensive line help on the way through free agency and the draft (right? ), I think that our offense can be remade in the image of our defense, and that progress can be swift in 2007. Like I said, just imagine if our offense could score 18 points. Bravo to Aaron "The Thief" Brooks for stealing time and yards, and adding an immediate and welcome spark to our offense. I'm frustrated with another loss, and Brooks' interception at the end of the game was a killer. But considering our protection issues, this could have been a total disaster, and it wasn't, because Aaron Brooks bought time and completed some very difficult throws. He showed toughness, too. The Raiders are trying and fighting and, unfortunately, still losing. But I can live with the latter because of the former. According to reports, Aaron Brooks will be the starting quarterback on Sunday. I hope that Andrew Walter didn't talk his way out of job. If that's not the case, then he apparently played his way out of the job. I'm not sure how I feel about this. I won't be surprised if Brooks gives our passing game an immediate lift. The offensive line and the playcalling were utterly ridiculous during those first two games. Brooks never had a chance. I think that things have improved a bit since then, and that his veteran experience and mobility might add some spark to our offense. If this happens, I will be ecstatic. I'm literally starving for some offensive fireworks. At the same time, I hate to see our presumed quarterback of the future go back to the bench after starting seven straight games, because it means he either simply doesn't have the chops, at least this year, or that he is a victim of larger circumstances on offense. Neither scenario is terribly appetizing. So no pressure, Aaron Brooks. All you have to do is make it better. Fast. I'm rooting for you. Randy Moss - Mr. Honesty? While most of us are naturally teed off by such comments, a contrarian view is emerging in the local media: Randy Moss, Mr. Honesty. In a blog entry published yesterday, Jerry McDonald, whom I respect, doesn’t give Moss a pass, but definitely cuts him some questionable slack. Today, another writer takes it a big step further, going off the rails by giving Moss a “thumbs up” for honesty (thanks to Stick ‘Em for tipping me off to this piece). The writer says that Art Shell and Tom Walsh aren’t trying, so why should Moss? Look, you can say Walsh is failing, but don’t tell me he’s not trying. Same with Art Shell. I don’t like everything our coaches have done so far, but don’t tell me they’re not trying. That’s a nasty and unfounded accusation. Of course, this writer also proposes a new Raiders ownership group composed of Steve Young and Brent Jones. Strange, my cuckoo clock started going berserk when I typed that last sentence. So before we give Moss a pass, let’s review the following statement: “Maybe because I’m unhappy, and I’m not too much excited about what’s going on, so my concentration and focus level tends to go down when I’m in a bad mood.” Now, let’s contrast this statement with other real-life scenarios. A police officer might tune out his captain during a briefing, he might even have some issues with the department, but if he finds himself in the middle of an armed robbery, he’s going to give a full focused effort to deal with the situation, because that’s what police officers do in crunch time. Similarly, a teacher might be having problems with the superintendent. He might be sick of the parents. But if a child comes to that teacher in a crisis, he will give a full focused effort to deal with the situation, because that’s what teachers do in crunch time. For a professional football player, crunch time is defined as 30 minutes of action on 16 autumn Sundays, if you’re averaging the time that one of two units is on the field. Lack of focus or effort during crunch time is never excusable. According to the calculations of Calico Jack, Moss makes $625,000 per game. With great income comes great responsibility. Remember, this isn’t Andrew Walter grousing about a playbook that’s putting his life at risk. It’s a wide receiver talking about his failure to catch easy balls, and thus to perform his core job responsibility. It is the equivalent of a running back fumbling the ball over and over—then shrugging and blaming it on a lack of focus due to a bad mood. I’ll tell you what, if that were the case, and if this were LaMont Jordan speaking, you wouldn’t be reading too many articles about LaMont Jordan, Mr. Honesty. It’s time we stopped giving Moss a pass—and time that he started catching more passes. Even if you sympathize with him, even if you think his excuse is valid, can we agree that he should be held responsible for once again choosing words that are insulting to the Raider Nation? I don’t want to hear about his bad mood causing dropped balls. Ever. Why? Because I spend a good chunk of my disposable income, and my limited leisure time, rooting for this team. At the last game, I met fans who traveled across the country, and even the Atlantic, to root for the Raiders in person—only to see Moss drop balls, and later blame his “mood.” This is a violation of both our rooting interest and the basic tenets of football competition. Let me close by saying that I believe Randy Moss is an anomaly on this team. I believe that this team has great character. Veterans like Warren Sapp and Derrick Burgess have set the leadership tone on defense. Young players such as Chris Carr, Kirk Morrison, Thomas Howard, Justin Fargas, Michael Huff, Nnamdi Asomugha and Andrew Walter are giving it their all. I do not doubt the character of this team. I do not doubt that our players, and our coaches, are trying. But I do doubt that a certain player has articulated a reasonable excuse for dropping the ball. 1. Aren’t you just loving all of these interceptions, particularly after last year, when we set an NFL record for fewest interceptions? It’s just one more sign of a defense playing at a lights-out level. Over the past five games, our defense is giving up an average of just 14 points per game. How can you be “the worst team in the NFL,” to quote ESPN just last Friday, when half of your team is playing among the elite? Let’s take pride, Raider Nation, in a defense that is setting the pace, that is giving us a chance to win, week in and week out, and giving us a lot of thrills to help offset the coma-inducing play of our offense. 2. While I am inclined to start feeling sorry of myself and the rest of you, I am reminded of the home game against the Dolphins almost exactly a year ago (November 27, 2005). I remember the mood after that loss, the Kerry Collins-induced stupor, the defense giving up 33 points, the fans filing out of the Coliseum like zombies, the life literally sucked out of us. While this game, like that one, was a November disappointment, the energy was entirely different. There’s no such thing as an enjoyable loss, but from a fan's perspective, I had a blast at this game. The tailgate was magnificent. The defense was righteous. The game was competitive. The house was packed, victory against a hated divisional rival was within our grasp. This is progress. 3. What is the point of putting Jerry Porter in a uniform and even putting him on the field, but nevertheless not actually using him? Either lock the door on the doghouse or use the guy to his fullest effect. One foot in the doghouse, the other on the field? What’s that accomplishing? Speaking of guys not playing, did you miss Robert Gallery? I didn't. 4. I could scream and shout about the offense, but I’ve already done that. I don’t want to instigate any more circular existential dialogue about whether the players or the coaches are most to blame. You know my take: blaming the front-line employees, the players, can only take you so far. At some point, you have to look at who’s managing and training these players, at who’s running the department. Listen to the players and you'll discover that I'm not alone. 5. It’s always inspiring to view the gameday experience through the eyes of others. After the game, Cousin of Raider Take and I ambled over to the Raider Nation Podcast postgame tailgate. Raider Greg and Charmaine (Mrs. Raider Nation Podcast) were, as always, gracious hosts. Tommy the New York Raider was there, having won a pair of free tickets courtesy of Raider Rick and Raider Nation Podcast. Tommy was joined by his friend Tommy (no, that’s not a typo). Keith, Dave and Richard were visiting from England, as they did last year for the Bills game. 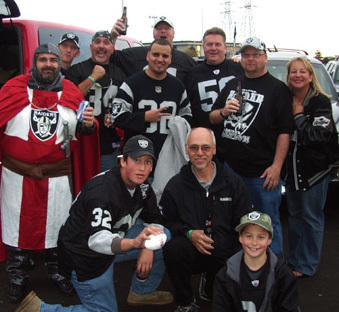 In fact, they flew into Seattle to catch the Monday night game, where they connected with Randy of Raider Nation Podcast, before traveling down to Oakland. When I befriend folks who have traveled across the country, and across the Atlantic, to watch the Raiders and experience the Raider Nation at its finest hour, I learn never to take the gameday experience for granted. Check out this photo I took. This is the whole gang, after the game. I don't see an ounce of quit. 1. The Raiders have not scored an offensive touchdown over the last 33 possessions. Think about that for a second. Consider that, between kickoffs and punts, you probably have an average field position around the opponent’s 30 yard line. So that’s 33 failed chances to go, on average, about 70 yards for a score. That’s verging on supernatural. Mark my words, this streak will end on Sunday. It has to end on Sunday. 2. In the Spotlight section of its home page on Friday night, ESPN featured two stories under the NFL header. Following are direct quotes from the story summaries. Story 1: “How badly do the Raiders stink?” Story 2: “Oakland is the worst team in the NFL.” Wow, you can slip a disk hating like that. 3. Horsecollar Jack wrote with a link to one of the ESPN pieces. In this piece, the author writes: “As the Raiders' ineptness reached new lows, the fellas in the booth took turns welcoming Christian Slater, Brian Bosworth and Michael Wilbon to the broadcast.” Look, I don’t have a problem with the guy calling the Raiders offense inept, but don’t blame the Raiders for this asinine pattern of interviewing so-called celebrities during the action on Monday Night Football. It’s starting to piss me off. For better or for worse, and usually for the better, the NFL rules its own image with an iron fist. Yet it allows a network to hijack its games with celebrity interviews? This has to stop. Raider Greg at Raider Nation Podcast also rants about this regrettable trend on his latest podcast. 4. Remember, the Broncos beat us by a score of just 13 to 3 in Denver, so I’m not going to be pessimistic about our chances. If we rattle Jake The Fake Snake, and if we can break this supernatural spell on offense, we can beat these guys. The three keys to winning this game are: (1) establishing the run; (2) stopping the Denver run; and (3) not dropping easy balls. Go ahead and call my analysis simplistic, but that’s simply how I see it. We know our offensive line will break down. We know Walter will be pressured. We know that Denver will try to compensate for the Fake Snake’s shortcomings by trying to jam the Bells down our throats. Therefore, we need to establish the run to alleviate the pressure on Walter. We need to ring some Bells. And we cannot afford to let easy balls hit the turf (memos to Moss and Anderson!). There’s no way to quantify our dropped balls to date, but they have been plentiful and lethal to many drives, and may have ultimately cost us some games. The time is now to turn the corner, turn the page, and at least give ourselves a chance to win the game on offense. 5. Come Sunday, the Raiders will now have been on local television for five straight games, which means that they have met the official sellout threshold for each of their home games this year, despite an uninspiring record. This is a magnificent development that speaks to both the new marketing programs of the Oakland Raiders and the fierce support of the Raider Nation through thick and thin. There will be no shortage of people ready to make some glue out of those old Donkeys on Sunday. 1. You can talk all you want about execution, but the question is: why aren’t we executing? If your company’s sales drop 75% in a year, and the stock price takes a dive, do you simply blame the middle managers and secretaries for not executing? No, you begin at the executive level, which in this instance is the coaching level. It’s the executives who are responsible for hiring the right people, establishing the plan, adjusting where necessary, and making it work with the talent at hand. I hate to say it, but on the offensive side of the ball, it looks like we have an executive crisis. 2. The dismissal of the running game in the first half was truly astonishing, as was the abandonment of it in the second half. LaMont Jordan averaged seven yards per carry, yet was only handed the ball nine times. Justin Fargas, a proven beast, was handed the ball once. I dare anyone to come in here and offer a reasonable excuse for this scenario, in a game in which we never trailed by a large margin. 3. I didn’t like the call to punt with less than a yard to go on fourth down at the Seattle 49 yard line in the second quarter. After the punt, which was a touchback, we netted 29 yards. Defense is our strength, so pursue the first down and don’t get too precious about field position. Score some points. Go down swinging. What’s the worst that could happen? A shutout? Oops. 4. The broadcasters worked themselves into an embarrassing, and telling, froth over Tyler Brayton’s knee to Jerramy Stevens’ groin. They screamed for a suspension! They called it indicative of a team out of control! It was the worst thing since…Randy Moss fake mooned the cheeseheads! Western civilization was crumbling! Then they went to one of their own, Chris Mortensen, who just shrugged and said it might be worthy of a fine, but likely not a suspension. Clearly, Mortensen forgot to drink his Kool Aid. I’m not saying it was okay for Brayton to jam his knee into Stevens’ groin (I would have preferred a fist to Stevens’ melon), but it hardly merited the Chicken Little outcry. 5. So, where do we go from here? You tell me. I'm out of answers. There's no point in discussing our defense. Our defense is ready, willing and capable. It's all about the offense at this point. a knee to the groin. Is it just me, or is this some of the craziest playcalling you've ever seen? One definition of insanity is repeating the same thing over and over again while expecting different results. Did our running backs get abducted by aliens? Who outlawed quick screens and outs? Is there an inside conspiracy to get Andrew Walter killed? What's going on? Monday night’s game is more pivotal than we might have expected just a few weeks ago. It signifies the difference between a mid-season record of 2-6 and 3-5. This margin of just one victory is larger than it looks on paper. It represents a gulf of both perception and emotion. At 3-5, our wave will be ever surging, with promises of finishing with our best record since 2002. At 2-6, we will wonder if we’ve been caught in the undertow. This season, to date, has been a tale of two units. The offensive unit has been largely offensive, in all the wrong ways. The defensive unit has emerged as magnificent. The screaming about Tom Walsh has been recently drowned out by the cheering for Rob “Caveman” Ryan. The sputterings of Porter, Moss and Gallery have been overtaken by the purring motors of guys like Morrison, Burgess and Asomugha. Lost in all of the noise, it seems, is…Art Shell. In other words, there’s been a lot of discussion lately about the crew and the officers, but perhaps it’s time to check on our captain. How’s he doing? Are we on course? Are we lost at sea—or pointing toward our destination? Talk about an asinine take. There are 11 teams in the NFL right now with winning percentages equal to, or worse, than the Oakland Raiders. Of those 11, several are led by coaches like Nick Saban, Jon Gruden, Mike Nolan and Joe Gibbs who have had ample time and resources to build their teams in their own image, just like Denny Green. Unlike most of these teams, the Raiders have steadily progressed, culminating in two gutsy wins over the past two weeks. Yet it’s Art Shell who’s barely edging out Denny Green for worst coaching job this year? Nonsense. Art Shell was hired to, above all else, instill a winning attitude and a sense of purpose in a team that had lost its way. In my opinion, he got off to a rough start. I think he was rushed, due to his late hiring, and I think he was rusty. On his watch, our wide receivers corps went from solid to sickly, with Porter stuck in the doghouse, Gabriel shipped to New England, Moss running his mouth (but not his routes), and Alvis Whitted starting for the first time at age 32. He failed to throw a red flag for a crucial first down against the Browns, not as an informed decision, but due to a lack of preparation and systemization. He seemed to lack a long-term quarterback plan for the team, to the point of turning to Tui for answers. His handling of the Porter problem was old school, but it threatened to turn the locker room into Animal House. And yet…we’re starting to see that winning attitude, are we not? Our old captain is shaking off the rust. The rumors of mutiny were apparently exaggerated. The crew is adapting to the new rules, and the ship is righting its course. Coach Shell has been roundly mocked for his impassive face, for his steady demeanor. But is that not the genius of the man? He is in control, of himself, and seemingly of this team. Good captains don't panic. Time will tell, of course. But I like what I'm seeing, what I'm feeling, from this team, considering all of the circumstances. At 0-5, the Raiders could have easily gone into a shell. Instead, they showed the character of Art Shell. And for that, I say, kudos to the captain. P.S. I’ve got barbecued sea chicken on my Monday night menu.